In short, now! Start saving for retirement as soon as possible. The earlier you begin to save money, the more that money is able to grow before you withdraw it from your retirement accounts. A small investment made today could yield a far greater return by the time retirement comes than a larger investment made closer to the deadline. This is due to a concept called the time value of money, which we will explore along with your options for investing in retirement. Money deposited earlier has more time to grow. You’ll gain interest on not only the initial investment but also on the prior interest earned. So, each period you gain more in interest than the last. Basically, the earlier you put money into the account, the more rapidly it will grow, which is displayed in the example. How Do You Start Saving For Retirement? There are many avenues to saving for retirement. You could put money away into a 401k with your company, save into an individual retirement account (IRA), invest in the stock market, or buy government or corporate bonds. If your company offers a 401k plan with matched contributions, you should absolutely take advantage of it. 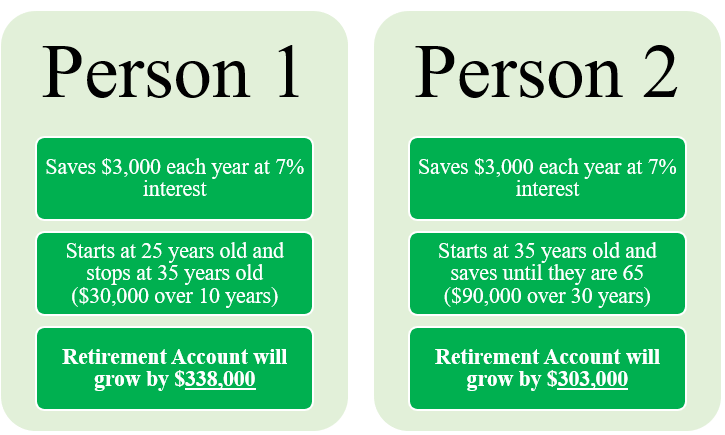 If you wish to open an IRA, you must decide whether you want a traditional or Roth IRA. Before deciding, understand the differences. 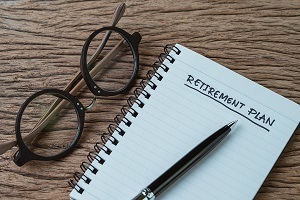 A lesser known retirement savings option is investing in an annuity. Annuities are another great option for retirement savings. This is an agreement for one party (generally life insurance agencies or investment firms) to pay another a series of fixed payments. This is a good way to ensure a steady flow of income for you. In an annuity, you deposit a large lump sum of cash to them. In exchange, the seller of the annuity agrees to return you a fixed amount of cash each period for the agreed upon the life of the annuity. Annuities can have a set lifetime, such as 20 years, or be set to pay out as long as you are alive. Why Set Up an Annuity Over Other Options? Another appealing characteristic of annuities is the lifetime income aspect of it. Other savings plans like IRAs and 401k’s are only good until they run out of money. Annuities are guaranteed through the life of the fund. In reality, no single savings plan works best for everyone, and they are most effective when used in conjunction with others. Everyone has questions about retirement, and the TJ Woods Insurance Agency is here to assist you with your retirement savings concerns and questions. Contact us with any inquiries you may have about annuities or other savings plan options.